roasted tomato soup and a sleeve. Well, and this Peanut Butter Popcorn. 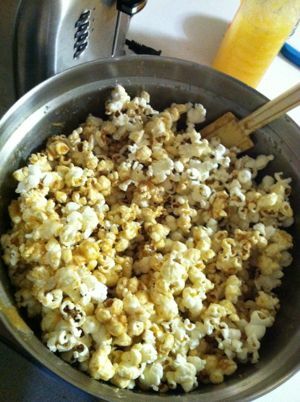 I doubled the amount of popcorn so that there would be a better ratio of savory/not so bad for me : sweet/bad for me, and I’m happy with that decision. 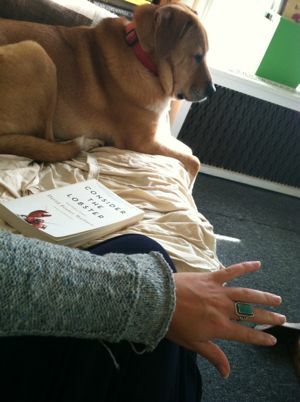 (Plus, there was more popcorn.) This totally helped me power through a lot of comments for my students yesterday. 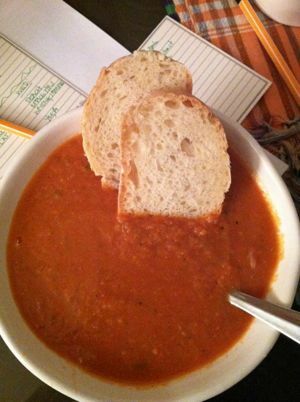 And here’s that soup: Heidi’s Roasted Tomato Soup from Super Natural Cooking. This one has been in my fall and winter rotation for a couple of years now, and every time I make it I am oh-so-happy. 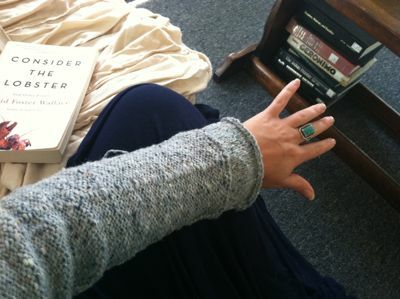 Last night’s debate gave me some dedicated sleeve knitting time — one down, one to go! Also, thanks for all of your ideas and comments about my mice! I don’t want to jinx anything, but so far so good. I’ve caught a few, and I’ve filled every gap I can find with steel wool. I also got some pouches of spearmint and peppermint labeled as natural, pet- friendly mouse deterrent. I figure it can’t hurt, especially with my critter-filled attic and earthen floor basement. Despite last night’s temps in the high 30s, I found no evidence of mice in the kitchen this morning! Hooray! I’m going to wait a few days to move everything back into the half of the kitchen I moved into the dining room, but I’m optimistic.